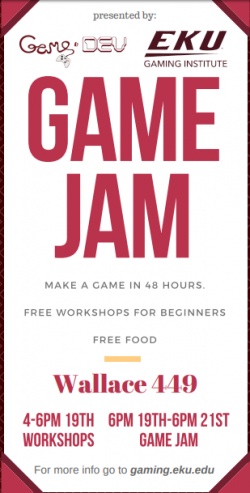 Come join us for the 6th annual Fall Game Jam, and make a game in 48 hours with us! We are introducing something new this year by doing crash course sessions because we want to make sure you all can come in to the game jam and get right to the action. EKU's Fall Game Jam 2018 with all of you!